The Atlas Fountain at Kenilworth Castle: Paul Jakeman’s most recent carving (for Fairhaven & Woods) can be seen at the newly restored Elizabethan Gardens at Kenilworth Castle. In just seven months, Paul singlehandedly brought forth from a 5 ton block of Carrara marble, the twin Atlas figures carrying the globe aloft surmounted by the Earl of Dudley’s Staff. This fountain is the centrepiece of English Heritage’s garden recreation. Paul’s work also included modelling the panels on the base of the fountain entitled; ‘Doris and her Daughters and ‘Triton’. 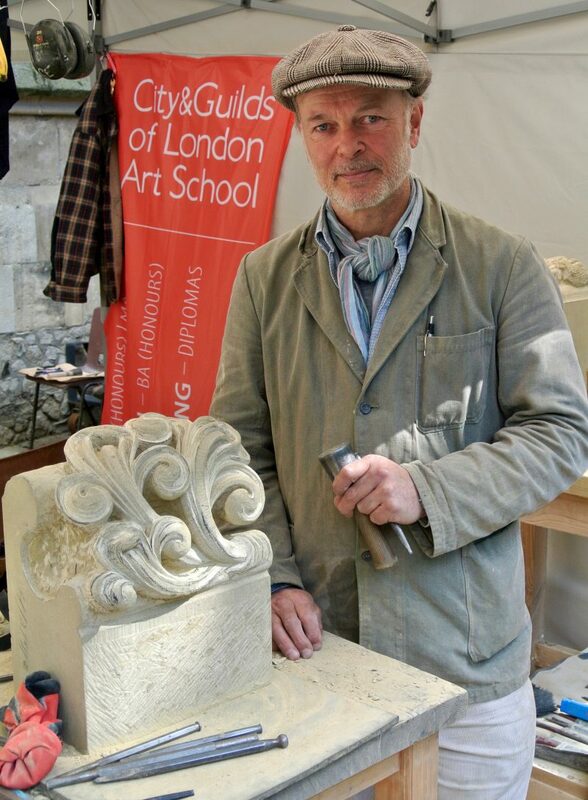 Paul is currently carving decorative cornice in Portland stone, involving, egg and dart work, rosettes and oak-leaves at Ketton Stone. His next project will involve modelling a coat of arms 2metre square in size for Andy Tanser. The Beasts of Bloomsbury: One of Paul’s most notable, recent large-scale projects (also for Fairhaven & Woods) was carving the front-facing unicorn on the steeple of St. George’s of Bloomsbury completed in the spring of 2006. This was a significant architectural and decorative restoration project of an important, Hawksmoor church that received substantial lottery funding and much media attention.